Dan Meyer grew up in Chappaqua, New York, and graduated from Horace Greeley High School in 1977, the eldest of six children. As the son of a state senator and nephew of a U.S. senator and ambassador, Dan acquired an early interest in politics and public service. While a student at Yale University, he served two terms as head of the student government, received the John C. Schroeder Prize for Leadership, rowed on a Henley-finalist crew team, and graduated in 1981 with honors in the field of Political Science. Over the course of his young adult years, Dan gained further life experience working on an off-shore oil rig, in a maximum security prison, at IBM’s world corporate headquarters, and on a farm. It was, however, several significant losses during his late teenage years which would prove most influential in Dan’s life and set him on the faith journey that led him toward a pastoral vocation. Following college, Dan spent two years as a volunteer assistant to the pastor of the Duncairn Presbyterian Church at the height of “the Troubles” in the city of Belfast, Northern Ireland. There he worked among the area’s youth and senior adults, helped to start a Christian community development center (now the 174 Trust), and played semi-pro basketball on a Northern Ireland championship team. Upon returning to the United States, Dan earned a Master of Divinity degree at Princeton Theological Seminary. Before graduating in 1985, he served as a seminary assistant at Presbyterian churches in Clinton and Woodstown, New Jersey and was awarded the Senior Prize for Excellence in Preaching. From 1985-1991, Dan served as an Associate Pastor of the First Presbyterian Church of Burlingame, a suburb of San Francisco. It was there, on New Year’s Eve 1988, that he married his wife, Amy, then a Silicon Valley sales executive, now a contract interior designer in Chicago and mother of their three children. In 1991, the Meyer’s were called to the Village Community Presbyterian Church of Rancho Santa Fe, north of San Diego. There they saw God grow a solo pastor church into a multiple-staff congregation with a full ministry program, new land and buildings, and an active stake in Christian missions. Since 1997, Dan has been Senior Pastor of Christ Church, a vital nondenominational, multisite church with branches in the Oak Brook and Downers Grove communities of Chicago’s near western suburbs. With an average weekend attendance of 2600 and an overall membership of 6,000, Christ Church employs 167 full-time and part-time staff (11 clergy) and more than a thousand volunteers. The church offers worship services in both a contemporary and classic/traditional style, sponsors a wide variety of spiritual growth ministries, and invests nearly $2M annually in 90 domestic and global mission partnerships and an extensive media outreach. Dan’s messages are broadcast weekly on WFLD-TV (Fox), WPWR-TV (UPN) and WGN radio, touching an estimated 1.5 million households. Beyond Christ Church, Dan chairs the Board of Trustees at Fuller Theological Seminary, from which he earned a Doctor of Ministry degree in 2008. He moderates the Executives Breakfast Club, a monthly forum for business leaders. 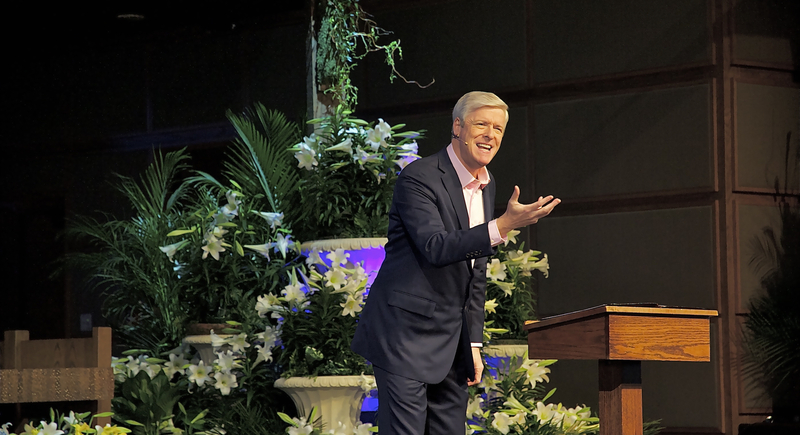 He holds four Emmy Awards for his past role as host of Life Focus — a television newsmagazine airing on PBS and other stations — and is the author of Discovering God (Waterfall Press, 2014), Witness Essentials (InterVarsity Press, 2012), and Leadership Essentials (IVP, 2007, co-authored with Greg Ogden).